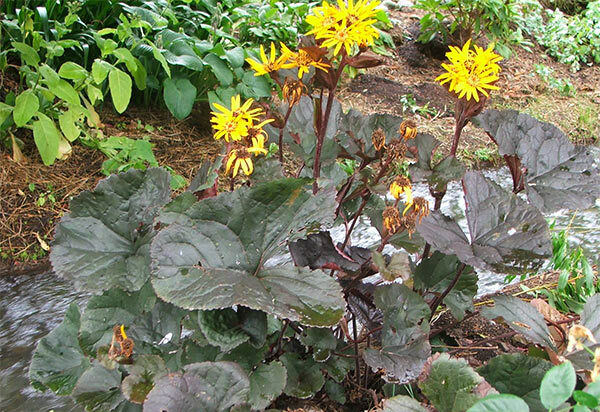 As a lover of foliage plants, I grow several varieties of Ligularia - crinkly, spotty, and plain. This elegant brown-purplish leafed Ligularia is my latest acquisition. It's a delicious colour combination (burnished brown leaves, subtle orange daisy flowers) which should make a strong water-side statement in my summer garden. Trouble is - these new Ligularias haven't quite made it, yet! Firstly their planting spot by the water race gets the fierce afternoon sun (oops - wilting leaves). Then there is little wind shelter (oops - rips and tears in stylish brown foliage). My loving application of compost isn't perfect to show off the colouring - brown leafed plants are notoriously difficult to present well in a garden design. For all the above reasons my new Ligularia has proved extremely difficult to photograph - and the sun, consistently and brilliantly shining all summer, hasn't helped! All in all I blame the head gardener! 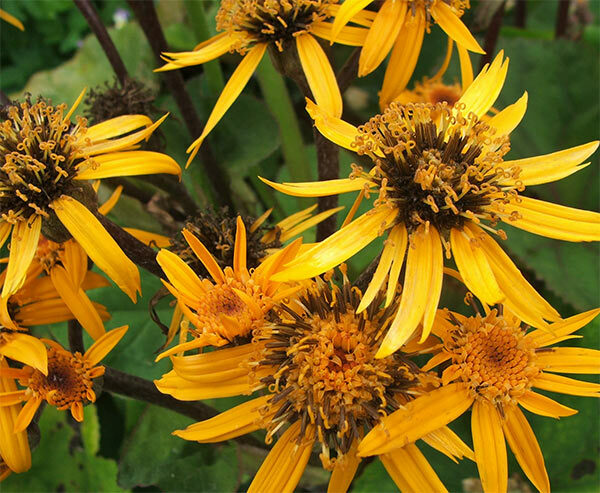 This Ligularia may need to relocate next spring. My other fancy Ligularias have pages of their own - Martian Invader and the Leopard Plant are their common label names. Neither of these have the orange daisy flowers, though - they are both strictly for foliage!